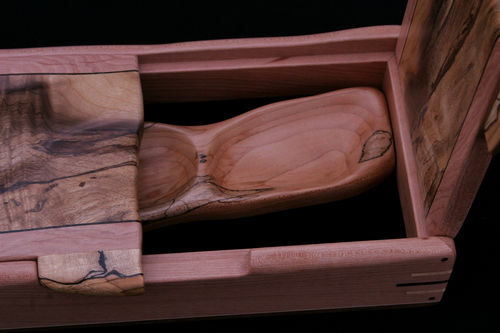 This wing box features a mix of woods that are native to Oregon. The body is Madrone, a hardwood that keeps its leaves year round, has a smooth red bark that peels back like a skin. The wood when freshly cut is a watermelon color. 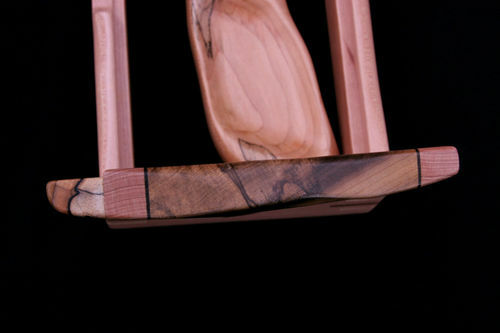 Typically the lumber leans towards a light pinkish color. Great wood to work with, cuts more like a hard plastic, it burns but they sand out pretty easy. Not a big commercial wood, you can find it here and there and as flooring. Love this wood. The lid is figured myrtlewood. Its also called pepperwood, bay laurel, california laurel. It stinks when cut, like peeing on a wood stove…not sure how I would know that. Burns easy and the marks are hard to get out, about like cherry. Great wood to work with. You do need to sand carefully through each of the grits. It has a chatoyance,( glimmer, shimmer, cats eye, tiger eye effect, like that)... similar to quilted maple, but better. This piece is uncommon, more colors and wild grain than is typically found. I have a source for more like this. 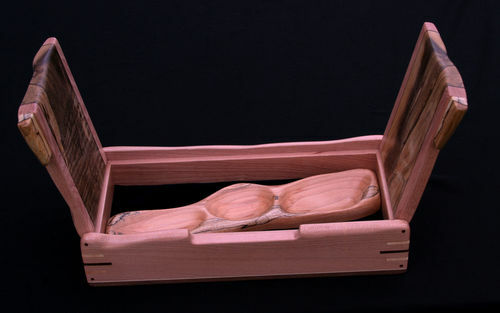 The handle and tray are spalted big leaf maple. The black lines in the handle are more pronounced that I usually get my hands on. Its a softer hard wood, it cuts and sands easy. The spalting is decay that will vary piece to piece, sometimes its very punky and needs to be cut away or stabilized with CA or epoxy. It can be difficult to get a smooth surface since the softer areas tend to “dish” out when sanding, not a big deal with shaped work such as these boxes. Maple and walnut are local woods and were used for the bottom band. Brass hinge pins are used at each corner and capped with bloodwood dowels I made, they were added to the bottom just to balance out the design. Wenge was used for the corner splines and for the separation strip on the lid, between the madrone and the myrtle. The tray is held in with magnets, a quick twist and out it comes. Not so necessary on this tray, but it does keep it in place. Finish is lacquer and the lining is black velvet. It is 12’’ x 5 1/2’’ x 2 1/2’‘ You will notice gaps where the lids join up, this was intentional. I was attempting to add to the naturalness of the sweeping seam and the organic shaping of the top. What do you think? The woods in this box are stunning! Love the colours and the grain detail. Love the box design. Always an inspiration to see your work Andy, very cool. All the woods you mention I have a few pieces, we get out to Portland a couple of times a year and I am hooked on wood collecting, Craigslist and others. Sometimes we have room for the suitcases on the return trip. Great work. Another great box Andy…wonderful design and terrific looking wood. Its funny that I was just reviewing your box making tutorial when this popped up. Must be something I need to try!! Really beautiful work. Top of the line craftsmanship. A lot of character there. Some of your signature touches set it off nicely. The carving flows so nicely and the wood is outstanding. Thinking “Out of the Box” again! Very nice work Andy. There is always something special when local woods are used. I cut down a myrtle tree several years ago and the wood was no where as nice as what you have. Another beautiful box Andy. Your craftsmanship on your box’s is amazing… Great work.